While I wrote that Apple didn’t need to fix the Mozilla Objection (where Apple began offering up Safari to users via Apple Software Update on Windows)… it appears they went ahead and fixed it anyways. Under the new version, released alongside Safari 3.1.1, Apple Software Update 2.1 for Windows now separates new software and updates. 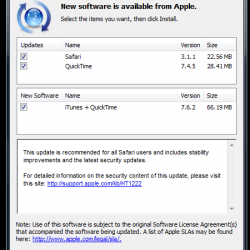 As you’ll see in the image below, the update properly lists Safari and QuickTime installed on my MacBook Pro as needing to be updated, but lists iTunes as new software which I haven’t chosen to install yet.